Beach Goth, originally uploaded by Brian Auer. 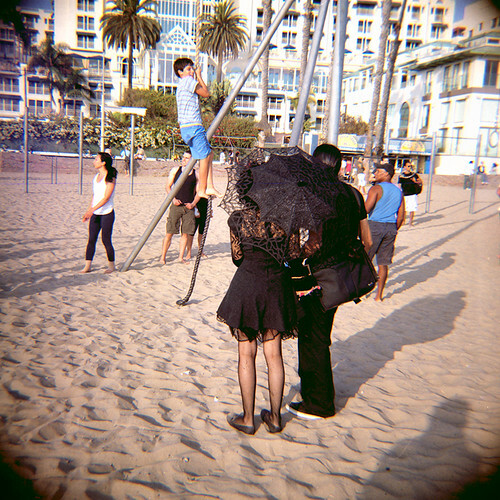 The lace umbrella (or Gothasol) is a repeating theme for the overheated Goth, although staring at youngsters as they swing on ropes puts me in mind of Tim Burton and Helena Bonham-Carter out shopping for children. LOL at your comments. But in all seriousness, that looks like a CUTE outfit! I need a parasol right now! GREAT photo. I cant believe shes wearing tights. id die of overheating! at least Mr. LA Goth is savvy enough to carry his matching black laptop satchel.